The Walt Disney Company told licensees and vendors to halt production in "highest-risk countries" like Bangladesh and Pakistan. 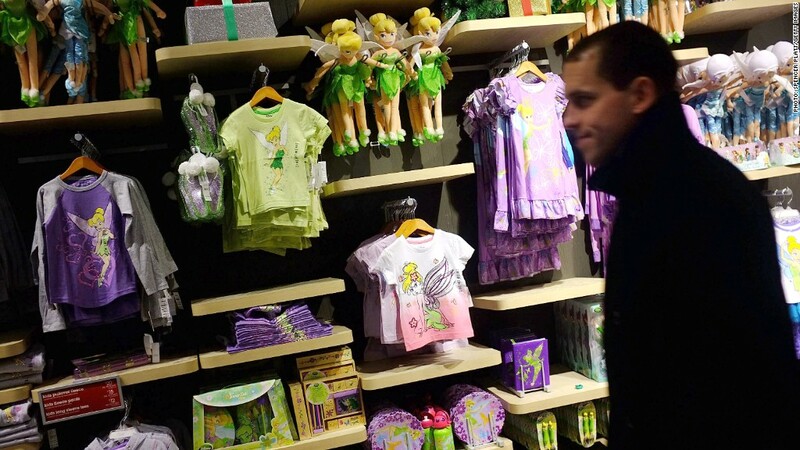 The Walt Disney Company has stopped production of branded merchandise in Bangladesh, in response to the spate of fatal factory accidents last fall. The company sent a letter in March to vendors and licensees to transition production out of the "highest-risk countries," like Bangladesh, in order to bolster safety standards in its supply chain. Disney will also halt production in four other countries: Ecuador, Venezuela, Belarus and Pakistan, by April 2014. The decision was made before last week's devastating collapse of a factory building in Bangladesh that left more than 400 people dead. It was prompted by the November fire at the Tazreen Fashions Factory in Bangladesh's capital Dhaka that killed 112 people, and another fire in Pakistan that killed 262 garment workers last September. While Disney (DIS) is the first brand to completely halt production in Bangladesh after the tragedies, it's a small chunk of what the company sources. Less than 1% of the factories that Disney sources from are located in Bangladesh. Even less are made in the four other counties, according to Disney spokeswoman Tasia Filippatos. The company said its decision was based on a report from the World Bank that assesses how countries are governed, using metrics like accountability, corruption and violence, among others. The five countries from which Disney pulled production had the lowest scores on those measures. Disney said it will continue to source from some countries, like Haiti and Cambodia, that didn't get high marks in the World Bank report, but only with factories that partner with the Better Work program run by the International Labor Organization and the International Finance Corporation. The group works to control health and safety conditions. Who's to blame for Bangladesh tragedy? Disney isn't the only company snapping into action after the latest tragedy. Earlier this week, a group of retailers, including H&M, Wal-Mart (WMT) and Gap (GPS), met with nongovernmental organizations and labor rights advocates in Frankfurt to discuss health and safety issues in the 4,500 garment factories in Bangladesh. On Monday, a trade association representing stores, the Retail Council of Canada, called an urgent meeting to discuss how to address the situation. Joe Fresh and Wal-Mart confirmed that they were participating in the meeting. The companies haven't said if they are taking any concrete action. The British retailer Primark on Monday said it will compensate victims who worked for its supplier, by providing long-term aid for children who lost parents, financial aid for those injured and payments to families of the deceased. A spokesman for the company said it has also partnered with a local aid group to dole out emergency food to families. Other companies like J.C. Penney (JCP), Benetton, and Sears (SHLD) -- all of which source clothes from Bangladesh -- have reaffirmed their support for worker safety and monitoring conditions in the country. The corporate reactions come as people are expressing outrage on companies' Facebook (FB) pages over the working conditions that retailers are willing to tolerate in order to sell clothes at cut rate prices. "Until companies like yours control the working situation and pay decent wages, it will happen again. And again," Linda Bowser Fallis posted on Joe Fresh's Facebook page.